NABC was originally developed by Stanford Research Institute and it is used to frame the development and communication of innovative solutions based on user needs and value creation. The the instructions is a description of the NABC model used for the design a course as an innovation process. NABC is unique in that user need is always its basis, and the point through which an idea’s ability to create value is increased. Value is created through the model’s four phases. N – Needs – Relates to user need as the foundation of a development process. A – Approach – Relates to the idea/approach that will address the user need. B – Benefits – Relates to the advantage that the user has by making use of your solution. C- Competition – Refers to competitors and the resistance that your solution will meet along the way. Describe the target group need. 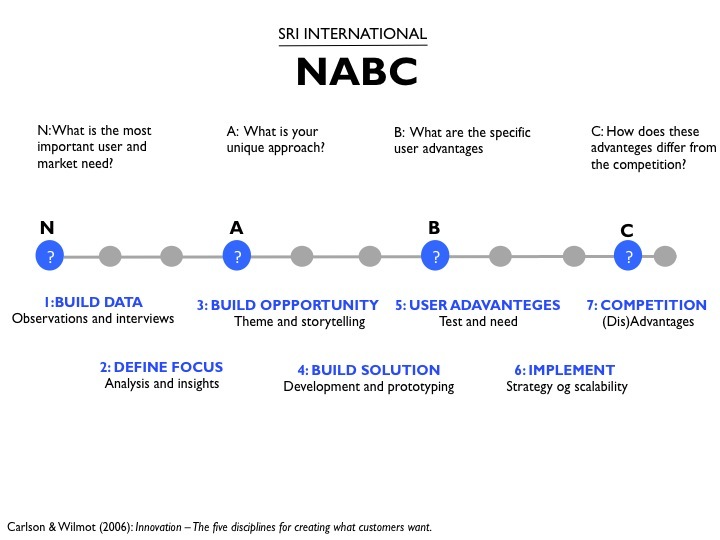 During the NABC model’s first phase you must address user need and answer this fundamental question: What is the most important user and market need? User need is the basis for your development process. Therefore, it is important for you to be goal-oriented and discover the most critical, precise user need from within your target group. There are numerous approaches for garnering information on user need. Some of the most effective ones are found in anthropology, ethnology and sociology, and include: participant observation, surveys, interviews and user tests . The objective here is to select a method that allows you to come into direct or indirect dialogue with your user. The more insight gained into a user, the stronger the identified need will be, and thereby, the likelier the chance that your solution will be a success. During the NABC model’s second phase you must address idea generation and idea development and answer this fundamental question: What is the unique idea and approach to solving the need? Phase 2 is characterized by being an idea generation phase. Brainstorming techniques and methods will be heavily used. Beyond idea generation, during which quantity is the priority, there will be a selection sub-phase during which the most promising idea in relation to the user need will be chosen. Remember, this phase is exploratory in nature. Describe the project’s user interactions (context) and the positive effects for the target group and clients. NABC’s third phase deals with user benefits. You will need to address this fundamental question: What are the specific benefits for users? Phase 3 is an idea generation phase. If the idea satisfies an important need, it is in itself a benefit to the user. So this phase is the time to find the core aspect of your idea. That which is unique about your idea should be identified. Your idea’s core aspect should be so unique that it provides you with a competitive advantage. Focus on implementation through strategy and the scaling of the product. Describe what your client stands to gain in relation to the competition. NABC’s fourth and final phase deals with the advantages and disadvantages of existing competition. You must answer this fundamental question: How does this idea and its benefits distinguish it from what competitors offer? The idea you seek to realise should be able to succeed while competing for a user’s time and attention. Oftentimes, competition arises from similar goods and services offered by a competitor. However competition may present itself elsewhere, such as in a user’s hobbies or family patterns, habits, and routines. If the idea satisfies an important need, it is in itself a benefit to the user. So this phase is the moment to find the core aspect of your idea. That which is unique about your idea should be identified. Your idea’s core aspect should be so unique that it provides you with a competitive advantage. This phase is characterised by an analytic and critical approach. In order to provide a convincing answer during the last two phases of the NABC model, it may be necessary to tweak your idea in a new direction. Perhaps new elements can be incorporated into the idea, making it more attractive for users. At the end of this phase you will present your idea for your customer/client or other party. Carlson & Wilmot (2006): Innovation – The five disciplines for creating what customers want.